It's time for Fish Friday Foodies' February event. 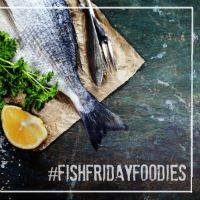 We are a group of seafood-loving bloggers, rallied by Wendy of A Day in the Life on the Farm, to share fish and seafood recipes on the third Friday of the month. This is, easily, my favorite recipe sharing event of the month. I always come away with a list of recipes that I just have to try! And this month, I am hosting. And you might, rightly, have noticed that this is only the second Friday of the month. You are right. We decided to push the date up a week so that people might be inspired for Valentines' Day though these dishes would be great for any date night in. Here was my challenge to the group for and event I themed 'Quite the Catch! ': You can always celebrate love and romance...any day of the year. So, please share your favorite seafood dishes for you and your sweetheart and inspire the rest of us! I had initially planned to make a raw Peruvian fish salad and plate them on heart-shaped dishes. But I received Miyagi oysters from our CSF (community-suppored fishery), Real Good Fish, this week and decided that those were perfect for a Valentines' event! The Miyagi oysters were fresh from Tomales Bay in Marin County just up the coast from us. Miyagi oysters are also called Japanese oysters. These marvelous mollusks can each clean up to 50 gallons of water per day. Reefs also create habitats for hundreds of other sea creatures, such as mussels and clams that also help filter water. And these are on the Monterey Bay Aquarium Seafood Watch's Best Choice list. Shuck the oysters. Steady the oysters in a dish cloth. Insert the tip of a knife between the shell halves, and slide it around as you pry it open. Using the knife, pull the muscles away from the top, flat shell and bend the shell back. Serve immediately with pomegranate mignonette. In a small mixing bowl, combine the vinegars, shallots, ginger, pomegranate arils, ginger syrup, and black pepper; whisk to combine. Serve with raw oysters. Even though it's a 50-50 chance that I will have an adverse reaction to raw oysters, when I see them in our CSF share, I can't resist. And, for this time - no reaction! Sweet. I loved these Miyagi oysters,they were sweet, briny, and just about melt in your mouth. I know I'm strange, but I would rather a plate of these on Valentines' Day than a box of chocolates! Next month, Karen of Karen's Kitchen Stories is hosting the group as we share recipes for fish tacos or taquitos. I can't wait! You are a brave woman! And so lucky to have fresh oysters from nearby! I am with you, Camilla! Not that I have an adverse reaction to worry about but give me a fresh, briny oyster instead of a chocolate any day. We usually enjoy ours with a squeeze of lemon and a little hot sauce but your pomegranate mignonette looks beautiful! I haven't heard of Miyagi oysters but then there seem to be so many kinds. Sadly my husband can't eat them, but I make an excuse to have a couple myself now and then. The pomegranate mignonette looks great. I, too, would take oysters over chocolates and I have a bottle of Picpoul that I have been saving to pair with oysters. Thanks so much for hosting this month. I have never tasted fresh oysters, but these look great and combo is yum!